Good grief! I really am into stripes these days. Autumn Fire is still on the needles, as is the black & clown barf striped cowl. They have each only grown in length by a a few rows over the past week. I've been knitting on the diagonal striped scarf instead. I got pretty excited when I started the diagonal stripe scarf. I desperately need to purge a few things from the stash pile in order to make room for newer, incoming yarns and last week, when I pulled out a bunch of partial skeins, it looked like I was making some pretty decent purging progress. But, alas, the diagonal striped scarf is not eating up anywhere near as much yarn as I expected it to. In order to make a noticeable dent in the pile, I may end up having to knit coordinating mittens. Lots and lots of mittens. Okay, since it's Wednesday and I'm linking up to Ginny's Yarn Along post, let's talk books. The e-book I mentioned last week but couldn't remember the name of.... was Nine Minutes by Beth Flynn. I finished it over the weekend. I enjoyed the story but the ending came on too quick. It read as though the author had suddenly gotten really tired of writing the book & sloppily threw together an ending just so she'd be done. As for this week, I'm still reading Skulduggery Pleasant by Derek Landy. I've mostly been reading this one while at work and work has been busy so it's taking me a while to get through it. Honestly, I'm a little surprised I haven't done the 'stay up 24+ hours straight to finish reading' thing with this book. It's a magical world collides with non-magical world story which reminds me a bit of Harry Potter and the characters have snappy, sarcastic comebacks which reminds me of Buffy the Vampire Slayer. Both of those are favorites of mine so I should be zooming through Skulduggery. I think I've just been too tired to read. Is it too early to start decorating for Christmas? It's a knitted Christmas sweater candle! If you zoom in, you can see the little knit stitches! I think I may be way more excited about this than a normal person should be. 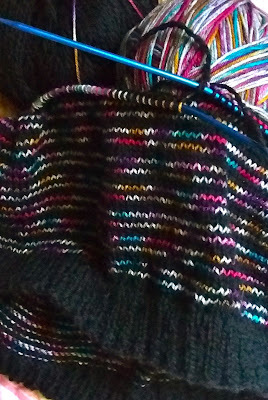 Stripes have taken over my knitting. 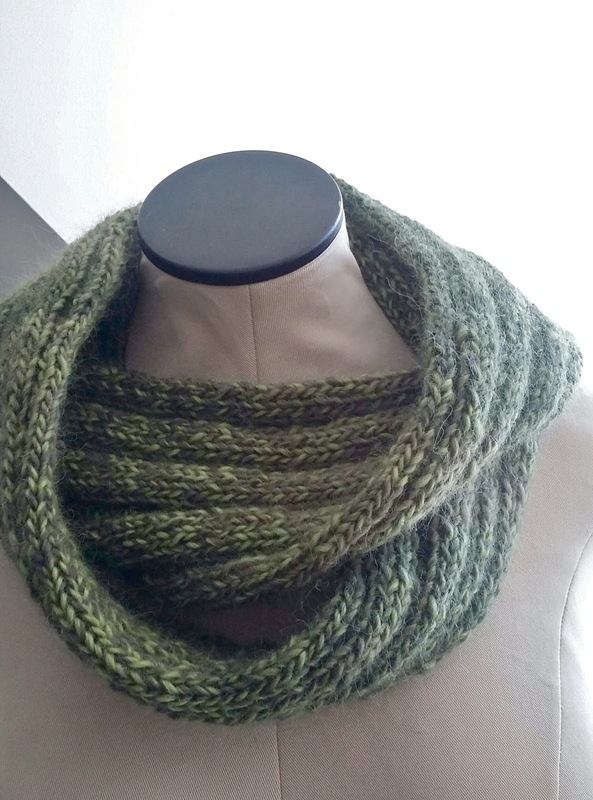 I'd started this cowl last month but frogged it back to the ribbing and started over. Originally, I thought it would be fun to add a blue bead to each splash of blue yarn. You know how you picture some fantastic thing in your head but the reality of it turns out to be so awful you frog it and find yourself trying to pick up live ribbing stitches knit with slightly fuzzy black yarn? At night? Yeah, that was fun. But it's back on track now. Christmas gift #2 is in the works. I am SO rocking my Christmas knitting list this year! As for my reading, I'm rocking that too. Except I have no idea what the book is called that I'm reading. It's on my Kindle (which is really a cheap tablet that I use as a Kindle,) and my daughter has taken it to school with her (because her 5 month old non-Mac computer has died. Don't even get me started on how much I dislike non-Mac computers) and I've just realized that although I'm really enjoying the book, I have no idea what it's called. It's about a young teen girl who gets kidnapped by a biker gang, she gets the Stockholm Syndrome thing going on and ends up marrying the gang's leader. It sounds horrible but I'm actually enjoying it. Even though I don't know my book's title, I'm joining Ginny's Yarn Along. This must be a record for me. It's only October 14th & I'm already checking off the first item on the Christmas Gift Knitting list. Pardon the photo. It's barely one step above black & white. I was too lazy/rushed to move the mannequin further from the window & the sun is streaming in and the back lighting is well... You can see for yourself. But this time, it's actually okay with me that my photo is horrible. Maybe the cowl's recipient won't recognize it for what it is. The yarn is Mirasol Sami purchased back in the summer from the wonderful folks at Knitting B and the pattern is a simple 5 x 5 rib pattern. So simple, so soft, so thick, squishy and warm. I'm still knitting on the green Christmas gift. I think the yarn has magical powers. For two days, I've been knitting away, thinking that I'll come to the end of the skein any moment. The end never comes though. Sort of like the end of this project. Yes, this Christmas gift is starting to have that never ending feel to it. I'm having to fight the urge to start a new project, or twenty. 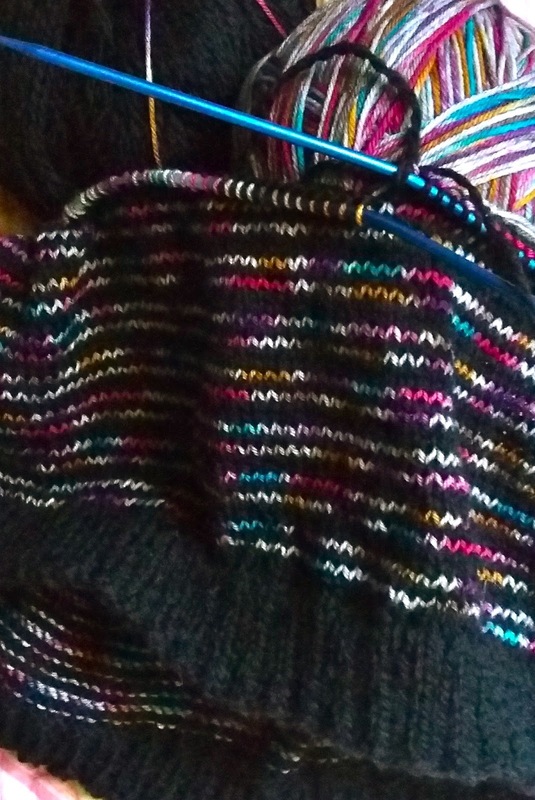 Instead of finishing the thing on my needles, I just keep adding to my Things To Knit in 2016 list. I could knit 24/7 for the next ten years and not finish everything on my 2016 list. Good grief! Oh well, at least I won't struggle with coming up with a list of things to knit in 2017. I can't believe another Wednesday has rolled around already. Where does the time go?? I'm still reading Once Is Enough. It's an interesting read but slow going because it's in paper form rather than digital. I don't have much opportunity to read real books these days. 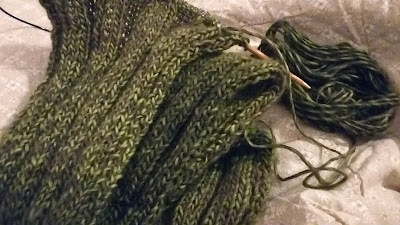 I'm also still knitting the green Christmas gift thing. I did manage to start and finish a hat this week. My intention is to get it listed for sale in my Etsy shop by tomorrow afternoon but you know what they say about good intentions.... We'll see. 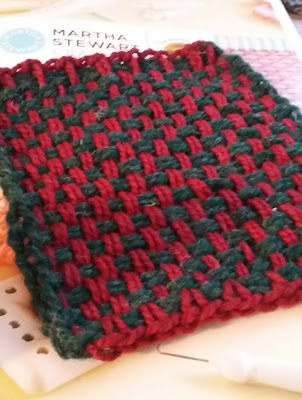 To see what others are knitting and reading, join me over at Ginny's blog, Small Things.